CFRI’s Premier Event “Junkers to Jewels” is the most comprehensive 3 Day Workshop and Bus Tour for Real Estate Investors offered in Florida. All local speakers. No upselling of any kind. Sign up before it sells out!!! 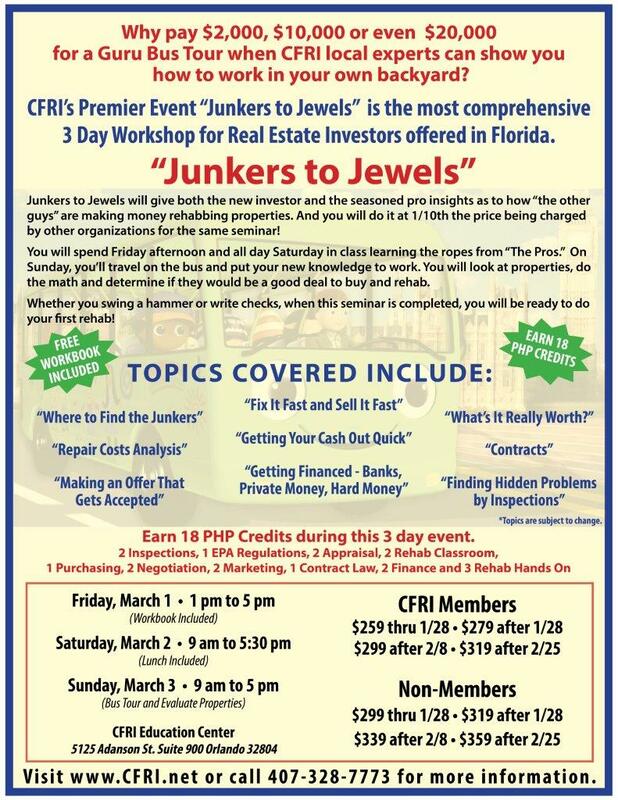 CFRI’s Premier Event “Junkers to Jewels” is the most comprehensive 3 Day Workshop for Real Estate Investors offered in Florida. Junkers to Jewels will give both the new investor and the seasoned pro insights as to how “the other guys” are making money rehabbing properties. And you will do it at 1/10th the price being charged by other organizations for the same seminar! You will spend Friday afternoon and all day Saturday in class learning the ropes from “The Pros.” On Sunday, you’ll travel on the bus and put your new knowledge to work. You will look at properties, do the math and determine if they would be a good deal to buy and rehab. Whether you swing a hammer or write checks, when this 3 day weekend is finished, you will be ready to do your first rehab!